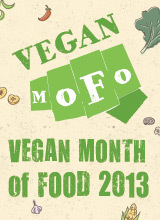 For this, the third week of VeganMoFo 2011, I am bringing back Flavor Bible Week! The Flavor Bible is a big book which tells you about ingredients, and lists their flavor affinities. I’ve scientifically chosen five random pages from the book (by closing my eyes and flipping to whatever page it lands on), and I’ll make a dish with flavor matches for each ingredient. Last year Flavor Bible Week led to interesting experiments such as Parsnip Spice Muffins, Chestnut-Celeriac Soup, Bean Salad with Herbed Yogurt Dressing, the Lychee-Dori, and Mushroom, Cheddar & Chive Crustless Quiche, which is still one of the best eggy tofu dishes I’ve ever had. Today I landed on page page 88, buttermilk! Not a vegan ingredient, but veganizable. Two of the flavor matches that jumped out at me were dates and brown sugar. Doesn’t that sound tasty? 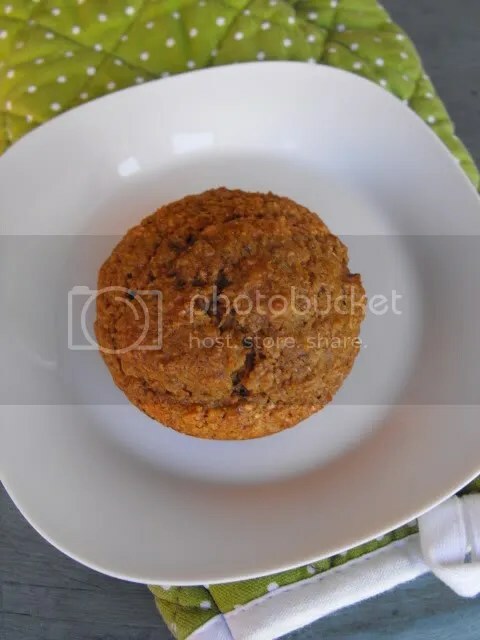 I thought bran muffins would be a good platform for these flavors, and found this recipe which fit the bill. To make vegan buttermilk, you add some acid (vinegar or lemon juice) to soy milk and let it sit for a few minutes. That’s it! 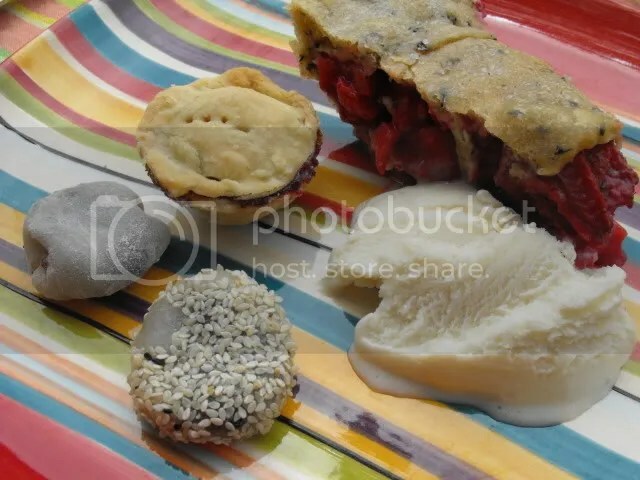 For a more scientific explanation, check out this article at veganbaking.net. Soy milk is really the best non-dairy milk for curdling, but if you can’t or don’t do soy, almond milk is a decent second choice. These muffins are very subtly sweet, and make a great snack or light breakfast. 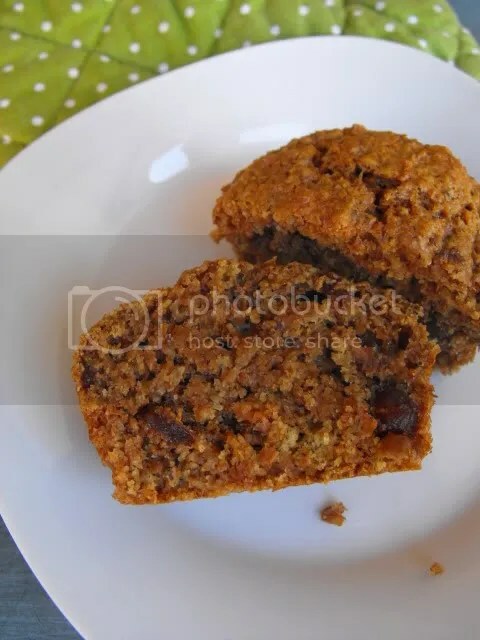 They have that dense bran muffin crumb without being crumbly or dry. If you don’t want to use dates, raisins would be great too. Adapted from allrecipes.com. 1. Preheat the oven to 375 degrees F. Grease 12 muffin cups or line with paper liners. 2. Pour the apple cider vinegar into a liquid measuring cup then add soy milk to measure 1 cup. Mix together and let stand a few minutes to curdle. 3. Whisk the flax and warm water together in a small bowl until the mixture starts to gel, and set aside to cool. 4. 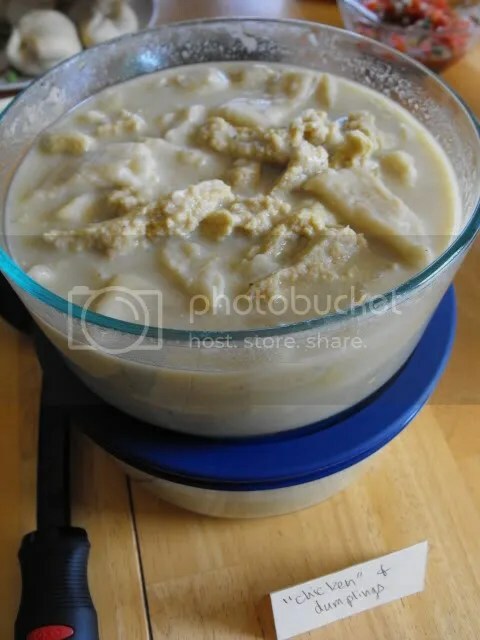 Once the soy milk has curdled, combine it with the wheat bran and let stand for 10 minutes. 5. In a medium bowl, combine the oil, applesauce, sugar, vanilla, flax mixture and soy milk/bran mixture. In a small bowl, sift together the flour, baking soda, baking powder and salt and mix well. Stir the dry mixture into the wet mixture, just until incorporated. Fold in the dates. 6. Divide the batter evenly among the muffin cups. Bake for 15 to 20 minutes, or until a toothpick inserted into the center of a muffin comes out clean. Let cool for a few minutes before moving to a cooling rack. For the final installation of Flavor Bible Week, I landed on pg 249, parsnips. I’m no stranger to parsnips – I love them in a roasted root vegetable medley, or mashed with potatoes, so I tried to find a new way to use them. In looking over the flavor matches, I noticed that parsnips pair well with some unexpected flavors, such as allspice, cinnamon, maple syrup, nutmeg and sugar. This got me wondering if parsnip could be used in a sweet bread, and the answer is yes! The first result in my google search for “parsnip bread” was this recipe for Spiced Parsnip Bread, so I went with it. I decided to veganize the recipe into mini muffins so that it would bake faster and be easier to eat. You honestly would never know there is shredded parsnip in these muffins! Dave ate one and had no idea. I think the trick is finely shredding it, and I will tell you that parsnips do not like to be finely shredded. The fibrous little guys would have preferred to stay in one piece, but I persisted even though I was afraid of shredding one of my knuckles. A shredder attachment for the food processor would have done the job much easier, but alas, I lost my shredder attachment long ago. In veganizing the recipe, the only ingredient I had to worry about was the egg. I planned to mix up an Ener-G egg replacer, and then realized I didn’t have any Ener-G, which lead me to ask “how long have I not had any Ener-G?”. Crazy. Then I contemplated a flax egg and decided I was feeling particularly lazy and didn’t add anything in place of the egg. I subbed applesauce for 3 Tbs of the oil, and otherwise followed the recipe. I added some extra almond milk to make up for the moisture lost in the egg, but the mixture was still way too dry! So I added milk and stirred, added milk and stirred, and finally got the batter to a consistency where I could get it in to the muffin pans. The taste, thankfully, was great! The spice combination was really nice, and like I said, you couldn’t tell there were parsnips in them at all. The texture, not so much, but that’s my fault for not putting in the effort of replacing the egg. They were too dense to be considered a good muffin. So, I’m not sharing a recipe, but I am here to tell you that you can use parsnip in quick bread recipes with excellent results. My friend Amey has the BEST potlucks. Whenever Amey hosts, I’m happy to make the drive down to Santa Cruz because I wouldn’t want to miss it! 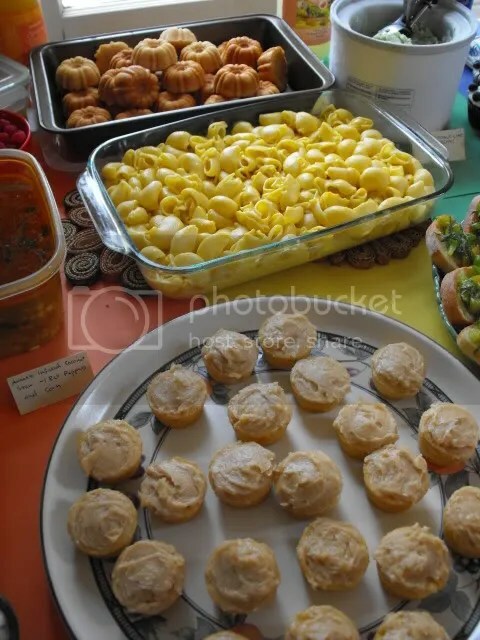 Back in July, the Santa Cruz PPKers had the brilliant idea for a Dumpling Potluck. 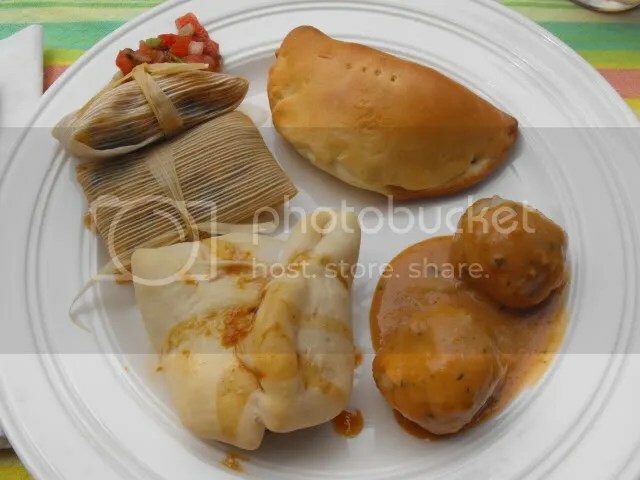 Anything was fair game, as long as it was in dumpling form. The turnout was smaller than usual, but the food was great. My contribution was “chicken” and dumplings, a reinvention of a dish I used to enjoy every year at Thanksgiving with my very southern family. 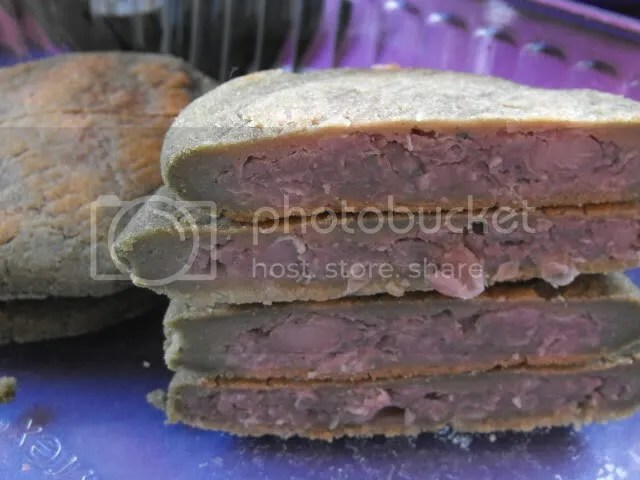 I based the soup on this recipe, and used a baked chicken seitan recipe for the chicken part. I wasn’t thrilled with how the seitan came out, but the dumplings and broth were dead on. Fantastic. 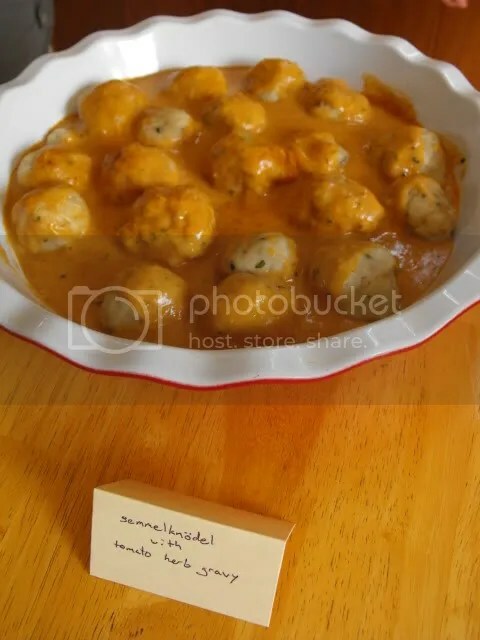 Some sort of tasty, doughy dumpling with a German name and delicious tomato herb gravy. Savory plate. I liked that everything was mini-sized. With some chicken and dumplings and blood orange soda. 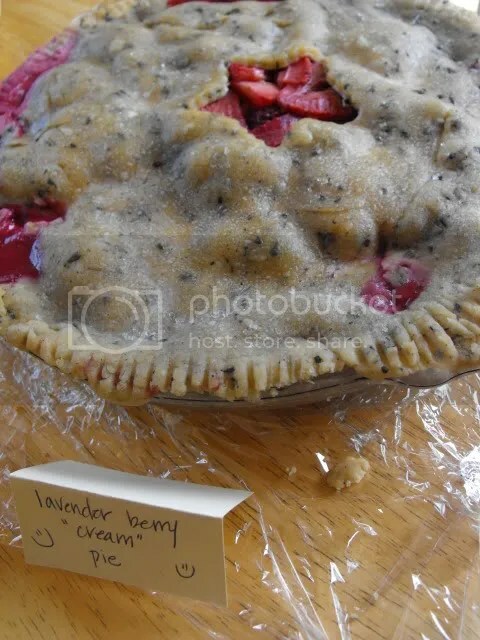 Lavender Berry Cream Pie. The crust on this pie was so good! Dessert plate, with vanilla ice cream. For a more timely and detailed account, check out Amey’s post here. 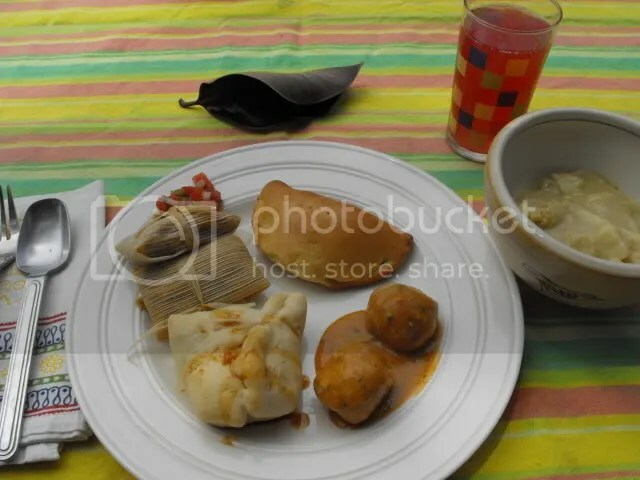 While all of the food was supremely delicious, we quickly realized that it was all very beige and didn’t exactly leave us feeling light in our loafers. 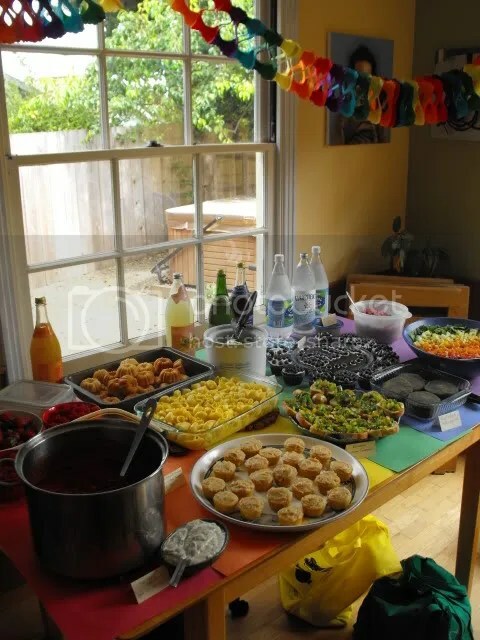 Someone came up with the idea of a rainbow theme for our next potluck, with the goal of more colorful and less carby food in mind. So, a few weeks ago we got together at Amey’s house again to taste the rainbow. We tried to go for a double rainbow of both savory and sweet, in tribute to the double rainbow video. I came to the color-claiming party late, and accepted a challenge by choosing a blue savory dish. 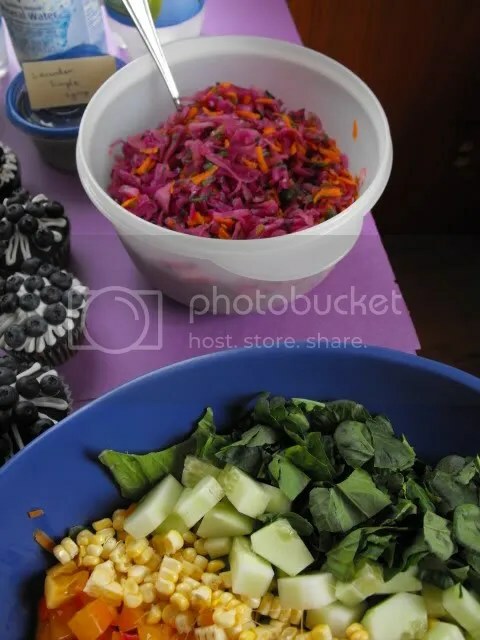 I wasn’t really sure what blue foods I could use other than blue cornmeal, and then I learned that you can dye foods blue with red cabbage water. Red cabbage basically acts as a pH indicator, and turns colors depending on its pH. Fun with science! I decided to make blue pupusas, with hopefully blue curtido. 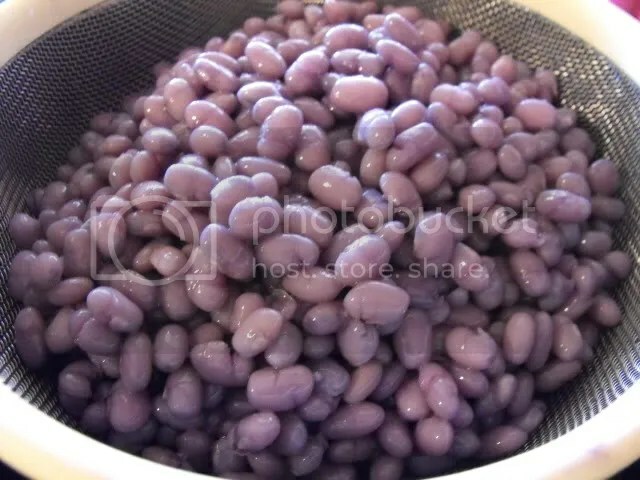 First, I cooked some small white beans in the red cabbage water. Then I refried the beans with onion, garlic, cumin and coriander. Then I used cabbage water for the liquid in making the pupusa dough. I tried to make the curtido blue as well by cooking red cabbage in baking soda water, and it turned the cabbage a beautiful teal color. Unfortunately, when I added the vinegar-based dressing the acidity turned the cabbage back to purple. It was actually kind of fortunate, as the violet portion of our rainbow would have been lacking otherwise. Violet – Red Cabbage Curtido and Lavender Simple Syrup hiding in the back. 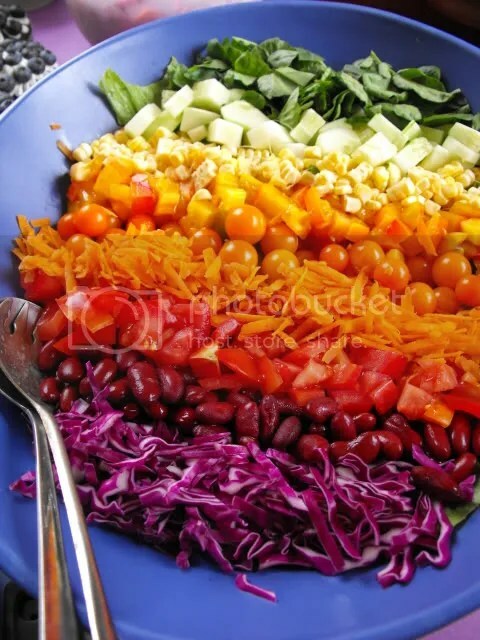 Gorgeous Rainbow Salad to finish things off. All together now, with rainbow steamer. I made less pupusas than there were people, so I cut them in half to reveal the pretty blue insides. 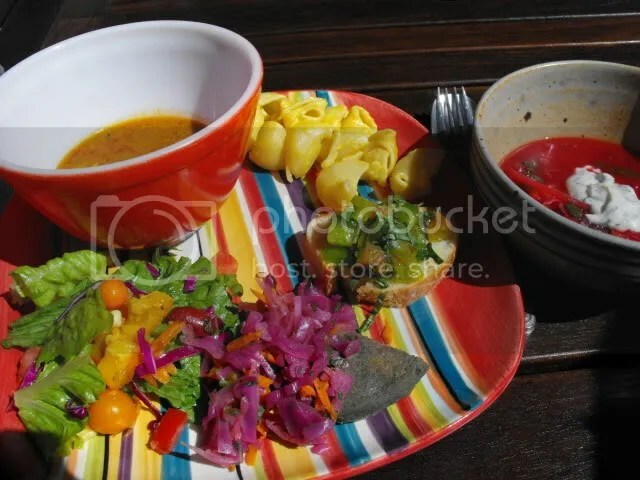 Savory plate, with both soups. Everything was so fresh and tasty! 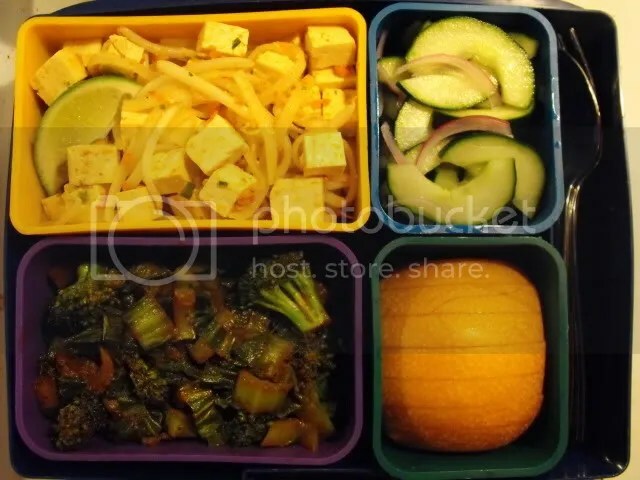 We definitely had more veggies than usual due to the color requirements. The mac n cheese was based on the VegNews recipe, and it was one of the best I’ve ever had. Dessert plate, upon which everything was awesome! 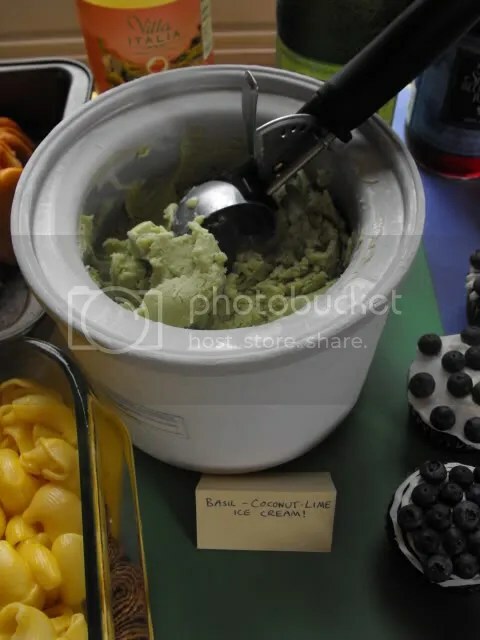 The standout was the basil-coconut-lime ice cream, which was outrageously good. The lemon bundt was also intensely lemony and wonderful. 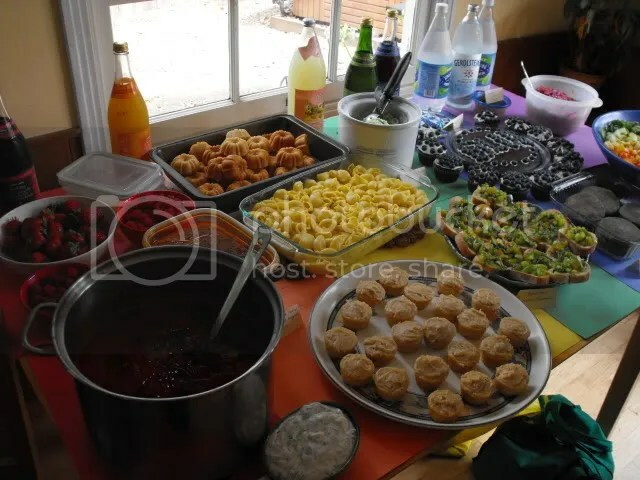 Sadly, I don’t have any people pictures from either party, because once I sat down with all the delicious food I just wanted to eat and enjoy the company. Amey has more details and some people pictures on her blog post here. Can’t wait for another Santa Cruz potluck! For my individual final project at Bauman College, I was required to choose a specific health conditions on which to write a report and give a cooking demonstration. My report was supposed to include a “brief” description of the condition, a 5-day menu plan, a few recipes and recipe costs. 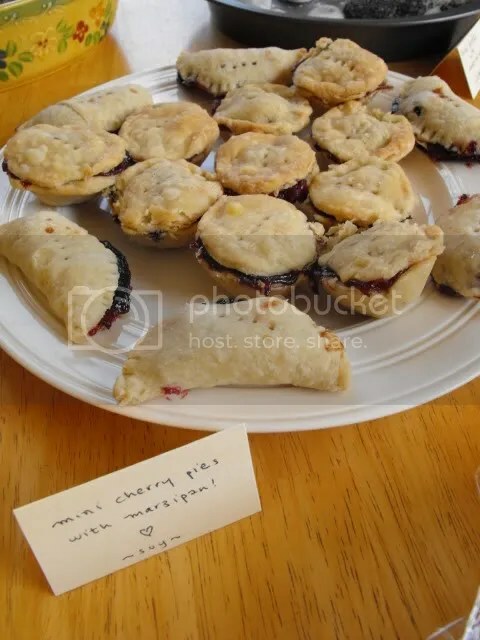 Then, we were to give a 45 minute demonstration, preparing two recipes and showing cooking techniques and presentation abilities, as well as providing nutritional information. There weren’t any health conditions I was really interested in reporting on, so I asked the program coordinator if I could choose cooking for vegan children, and she approved. I chose this topic because it’s something I really knew nothing about, and at the time there wasn’t much good, consolidated literature on it. Of course, this was before The Complete Idiot’s Guide to Vegan Eating For Kids came out. I haven’t read the book, but I imagine it holds a lot of the same information I came across in my research. I can also recommend Raising Vegetarian Children as an excellent resource. While the title says vegetarian, the book is really vegan and generally against dairy and eggs. Edited to add: A reader pointed out that the nutritional yeast is missing from the ingredients list of the soup recipe in the report. If you make the soup, be sure to add about 3/4 cup nutritional yeast when you blend it! The recipe listed below is correct. My demonstration also went well. 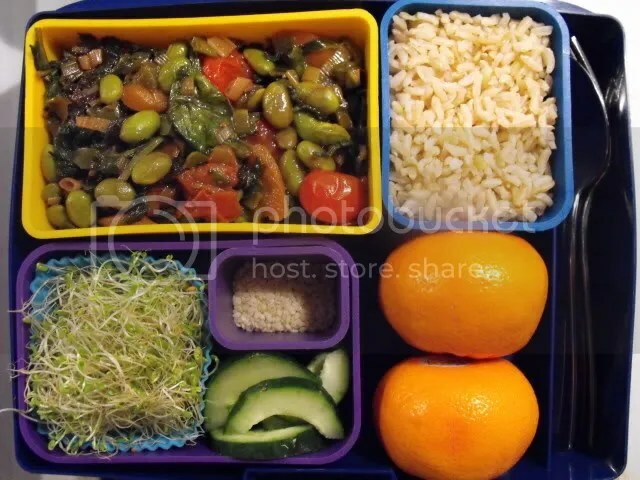 My audience (my classmates) felt a little cold to the topic at first, as none of them were vegan and they probably don’t agree with the idea of raising a child on a vegan diet, but as I started to cook they asked some questions and opened up as I answered and offered my opinions. Once I made sure that they knew I wasn’t trying to tell them that children should be vegan, but instead that they could, everyone was cool with the topic. We were only required to prepare two recipes, but I chose simple recipe and went for three, just because I enjoy challenging myself. I came in at 45 minutes exactly, including plenty of time for discussion. It was fun choosing the menu plan and recipes for my report. 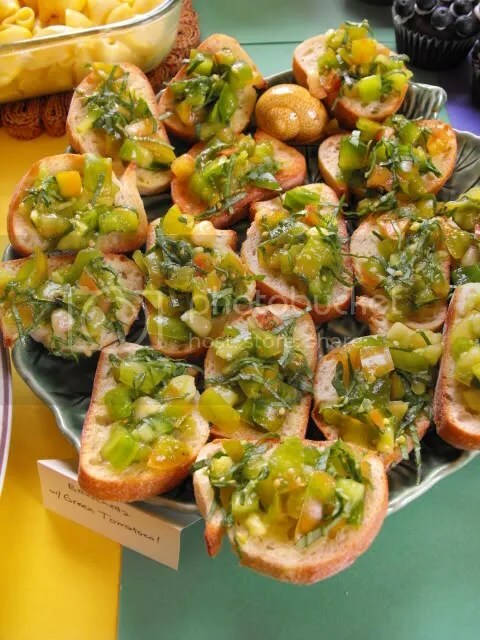 I think sometimes as chefs and foodies, we get so caught up with fancy stuff like reductions, infusions, ethnic cuisines, garnishes, etc., so it was fun to step back and think of food like a kid would. 1. In a spice grinder, grind the chia seeds into a fine powder. 2. 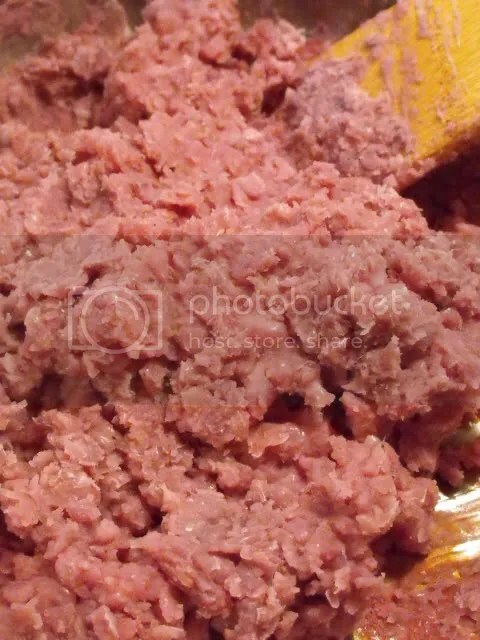 Place all other ingredients (avocado flesh through salt) in a food processor and process until smooth, stopping to scrape down the sides as needed. Add the ground chia seeds and pulse a few times to combine. 3. Transfer the mixture into four ramekins or small serving dishes. Refrigerate at least 30 minutes and serve cold. 1. Preheat the oven to 375 degrees Fahrenheit. Lightly oil a muffin tin and set aside. 2. Combine flours, cinnamon, baking powder, baking soda and sea salt in a mixing bowl and whisk together. 3. 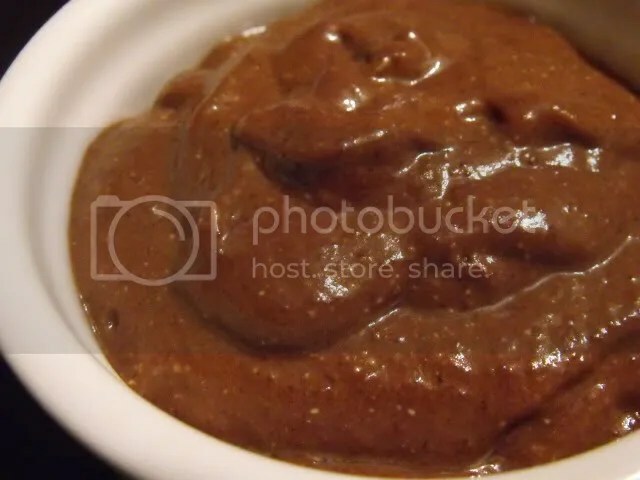 Place the bananas, blackstrap molasses, apple juice, apple cider vinegar, and flax seed in a blender and blend until smooth. Mix the wet and dry ingredients together, then fold in the shredded carrot, walnuts, and raisins. Add a bit more apple juice if needed to wet all of the dough. 4. Divide the mixture evenly into the muffin tin and bake for 20 minutes or until the top springs back to the touch. 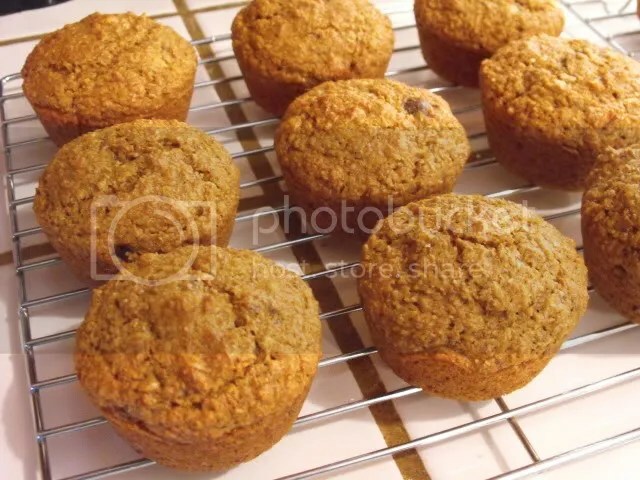 Remove muffins from the pan and cool on a wire rack. 5. 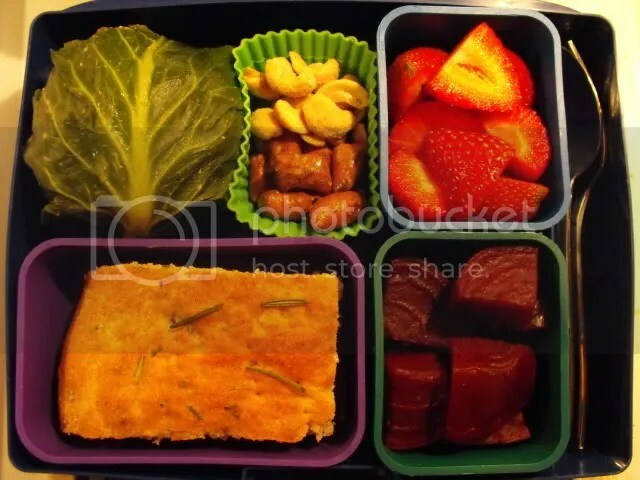 Store in an airtight container or freeze in individual freezer bags to eat as needed. 1. Place the potato, carrot, onion, and vegetable broth in a large pot and bring to a boil. 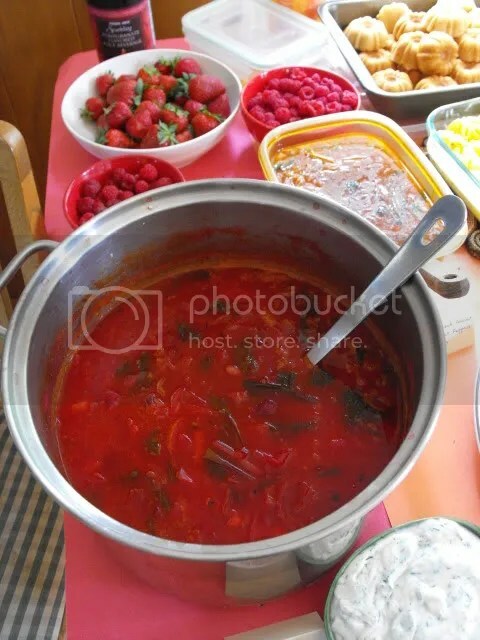 Reduce the heat, cover, and simmer, stirring occasionally, until the vegetables are tender, about 10 minutes. 2. 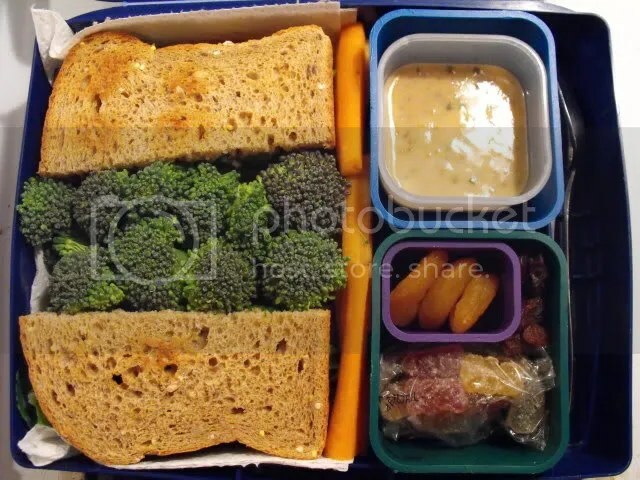 Meanwhile, place the broccoli florets in a steamer basket and line a pot with water. 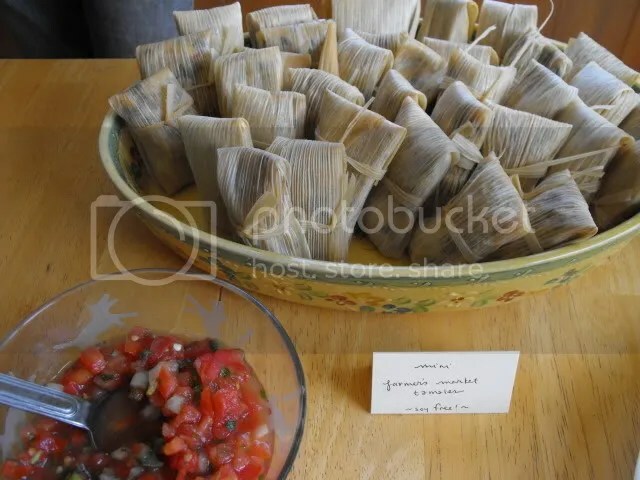 Cover, bring to a boil and steam for about 5 minutes, until easily pierced with a fork. 3. 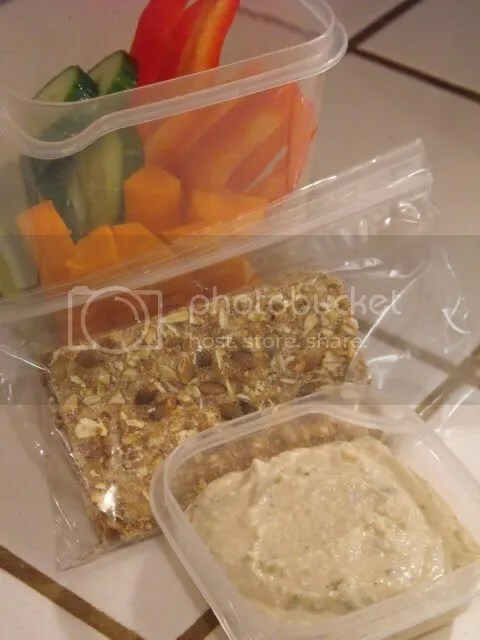 Place the remaining ingredients (chickpeas through milk) in a blender and add the cooked vegetable mixture along with any remaining broth or water. Puree until completely smooth. Pour the blended mixture into a clean soup pot. 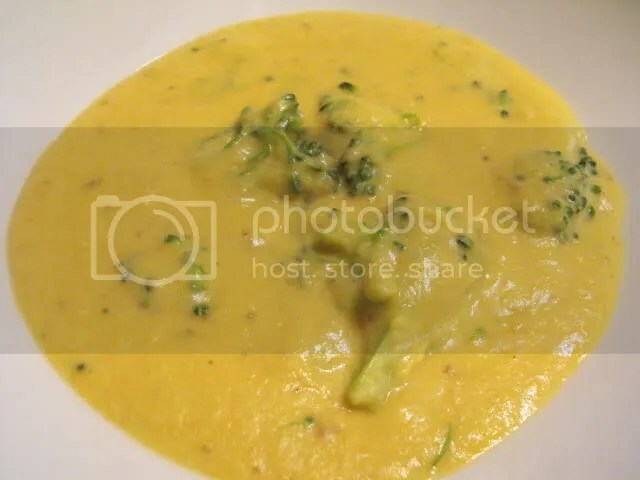 Stir in the steamed broccoli florets and warm the soup over low heat until hot. Do not boil. If the soup is too thick, add some additional milk or broth to achieve the desired consistency. Taste and adjust seasonings if necessary. Serve warm. The feedback on the recipes was generally good – the class LOVED the muffins. Some people thought the soup was a little too nutritional yeasty, but what can I say? I love me some nutritional yeast. I’ve got one more post up my sleeve relating to Bauman, and then you won’t hear me talk about it any more! I’ve gotten back into the habit of taking my Laptop Lunchbox to work a few times a week, and I’ve been enjoying it. 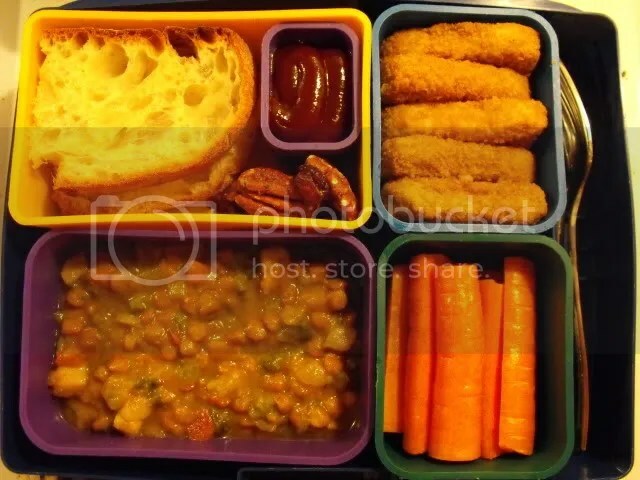 To celebrate, I thought it would be fun to prepare a few of the menus from Vegan Lunch Box Around the World, which I purchased a while ago but hadn’t cooked from yet. I picked the menus to use what I had received in my CSA delivery. For being so simple, the red curry vegetables were really good. The cucumber salad was your standard asian cucumber salad, light and fresh. The pad thai component was supposed to be from a boxed pad thai, but my grocery store didn’t have a vegan brand, so I chose peanut noodles instead and added some tofu. The noodles weren’t very good, but that wasn’t the cookbook’s fault. 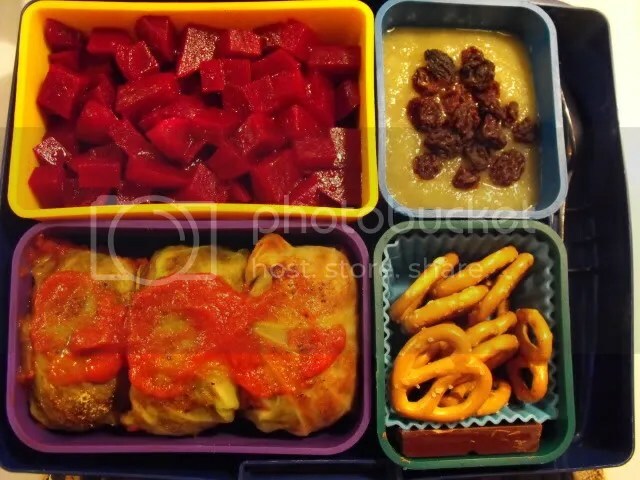 Next up, Germany: Cabbage Rolls, Beet Salad, Applesauce and Spitzbuben cookies. 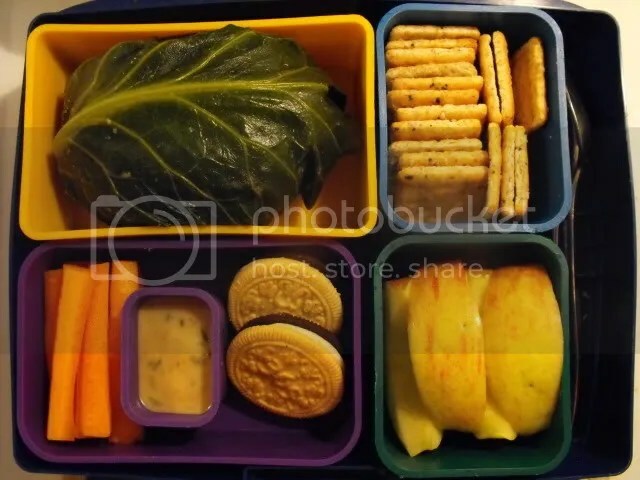 Except I didn’t feel like I needed cookies, so I subbed some pretzels and chocolate. Pretzels and chocolate are German, right? 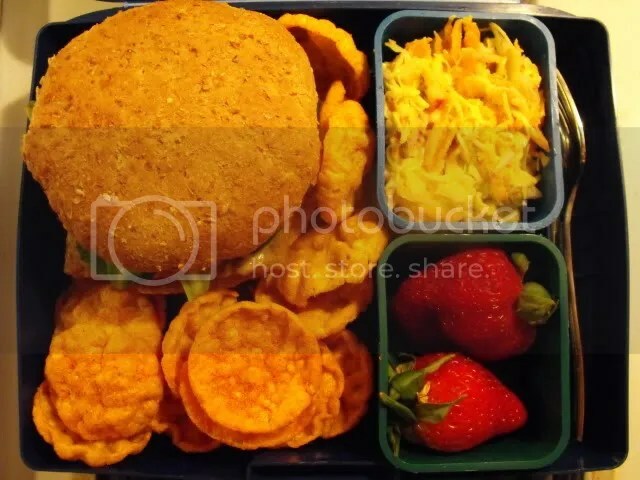 I was super happy with this lunch. The beet salad was really simple to make and really tasty. 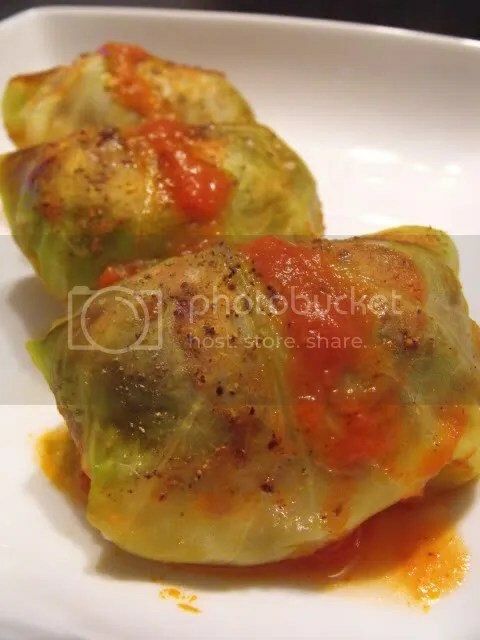 The cabbage rolls, with a filling of walnuts, chickpeas and brown rice, were surprisingly good. I thought the recipe was a little simple, but was really pleased with how the flavors came together. And, the filling held together nicely without any crazy binders. 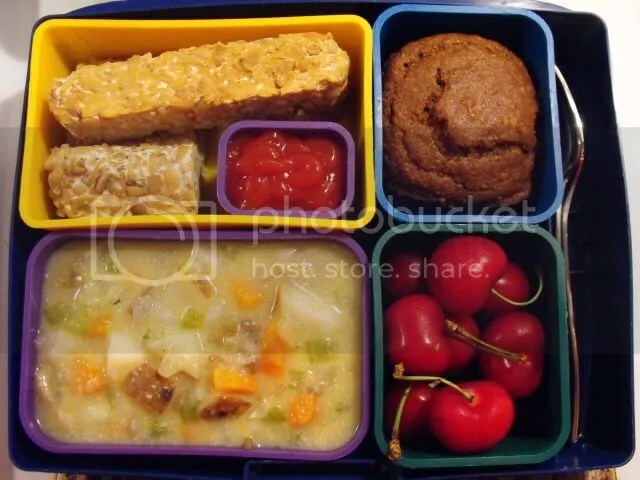 For my last themed lunch, New England: New England Chowder, Fish Crackers, Boston Brown Bread Muffins with Vegan Cream Cheese and a Pear. 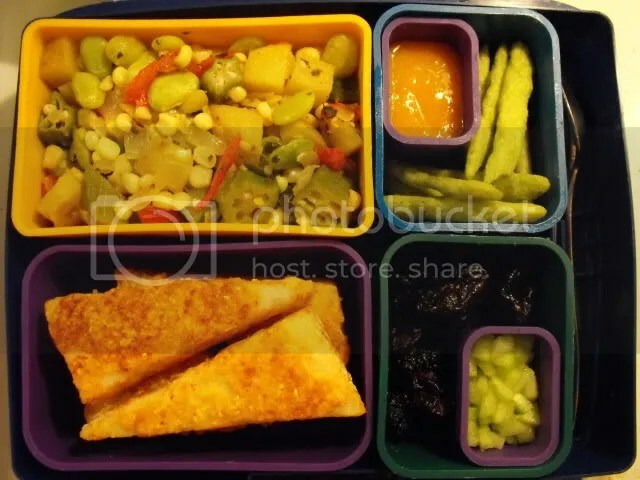 I thought the meal was a little carb heavy and protein light, so I cut out the crackers and added some fishy tempeh – tempeh marinated in vegetarian fish sauce. I also added some cherries to fill the fourth position because, well, cherries are fantastic! The chowder was good but maybe a little bland. I felt like it could’ve used some flavor of the sea, say, from seaweed, but I guess that wouldn’t be very kid friendly. 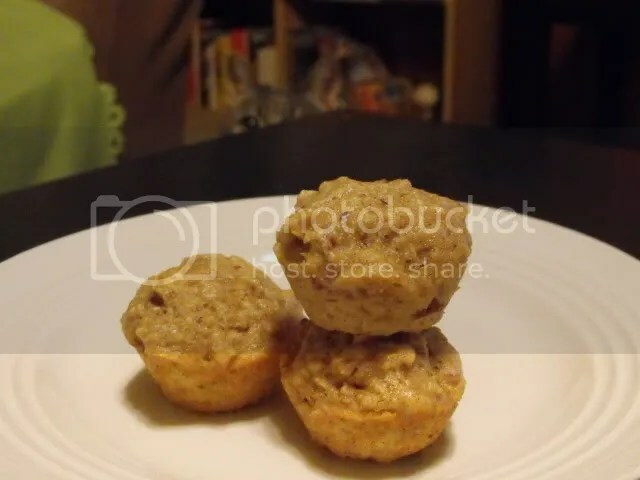 The brown bread muffins had fantastic flavor, but were undercooked in the middle, which was probably my fault. 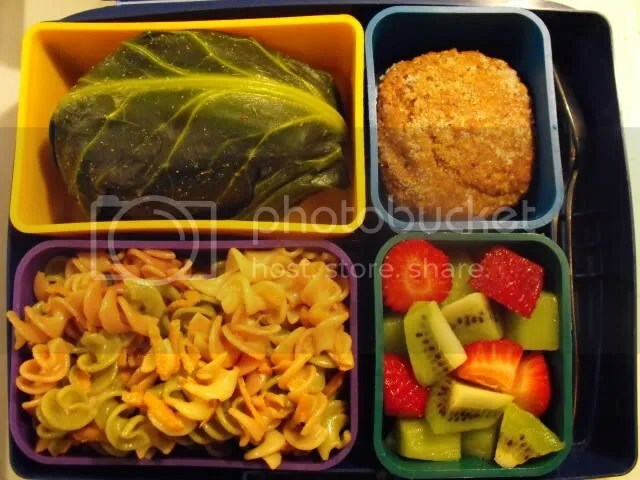 Here are a few more lunches. 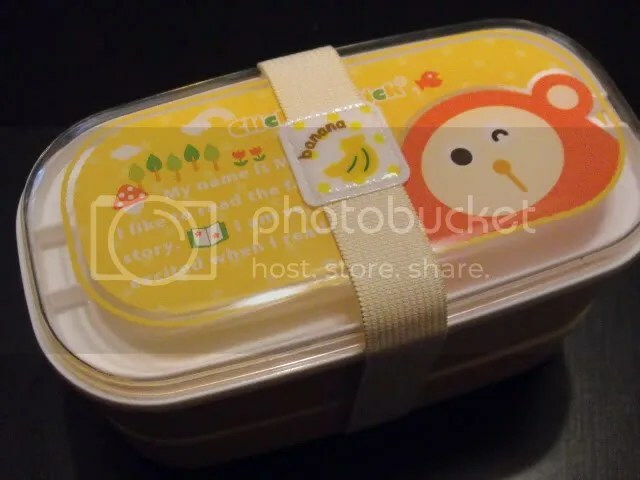 One day when I didn’t have a whole lot of food to take, I packed this cute little bento box which I had never used. 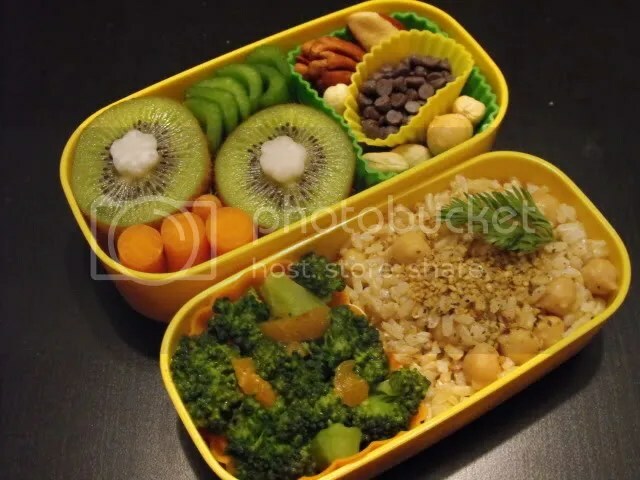 Bottom layer: kiwi with radish flowers, carrots and celery, mixed nuts and mini chocolate chips. 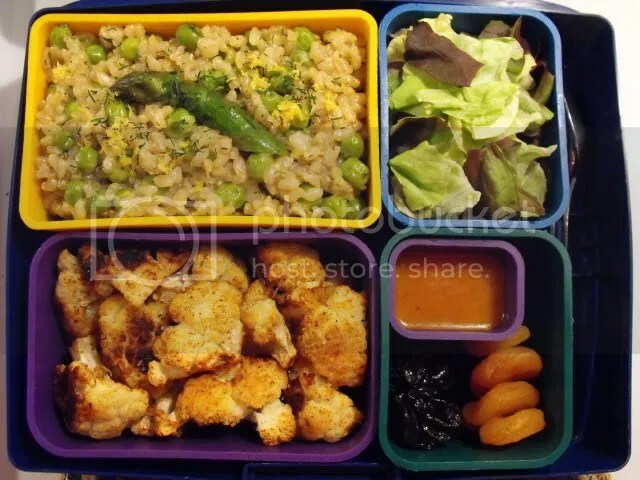 Top layer: steamed broccoli with mustard-apricot sauce, brown rice and chickpeas with gomasio. This was tasty and fun, but really small! I don’t know how people eat this tiny amount of food and aren’t still hungry! When I received lavender in my CSA a while back, I had absolutely no idea what to do with it. I had heard that if you use too much culinary lavender food can taste soapy, so I set about finding a few ways to use it well. First, I adapted the White Bean Hummus with Fresh Thyme and Basil from Eat, Drink & Be Vegan. 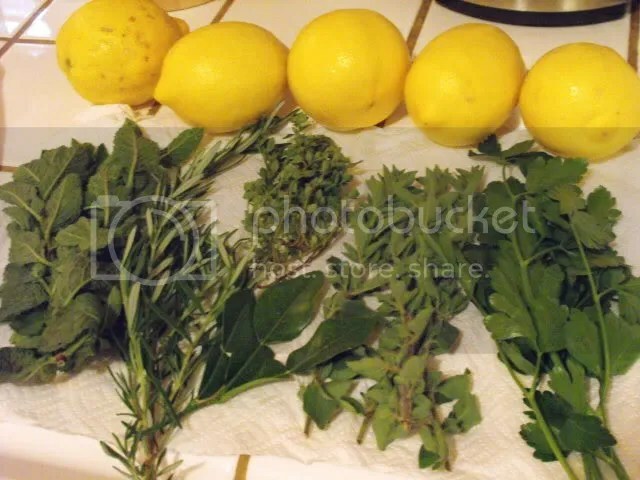 All I really changed were the herbs – I used fresh thyme, rosemary and lavender. It was a bit on the soapy side, so I probably used just a bit too much. Next, I adapted this recipe for Peppered Lavender Beef. Really, I just stole the seasoning mix idea. I ground up black and white peppercorns, fennel seeds, thyme and lavender, rubbed it on some extra firm tofu, and baked it. 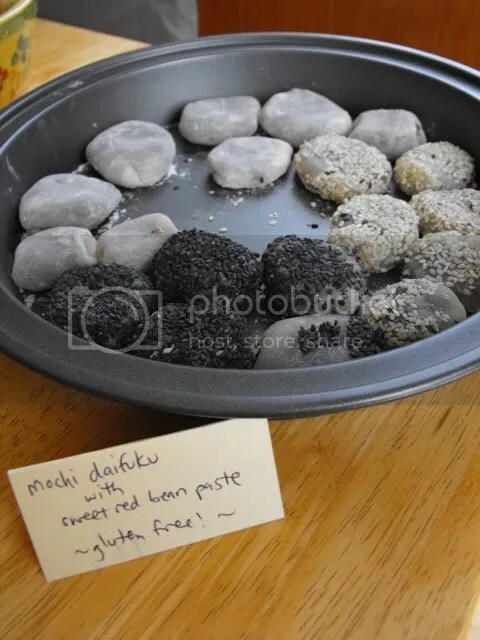 I really like the method of dry rubbing and baking tofu, it gives the tofu a great texture. 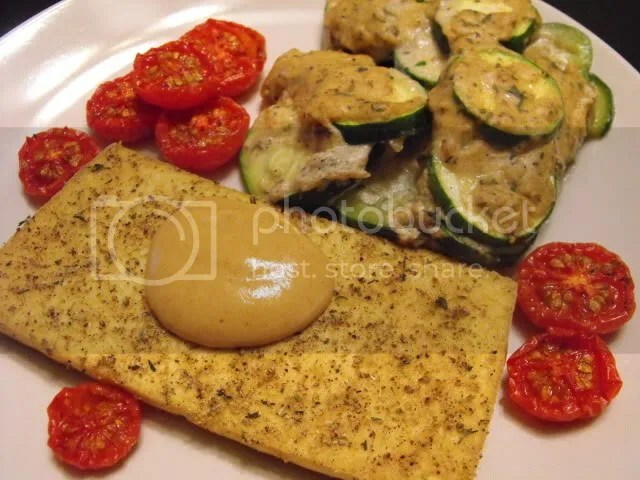 I served the tofu with dijon sauce, scalloped zucchini and slow roasted tomatoes. You can tell this is from over a month ago, when zucchini and tomatoes were still in season! 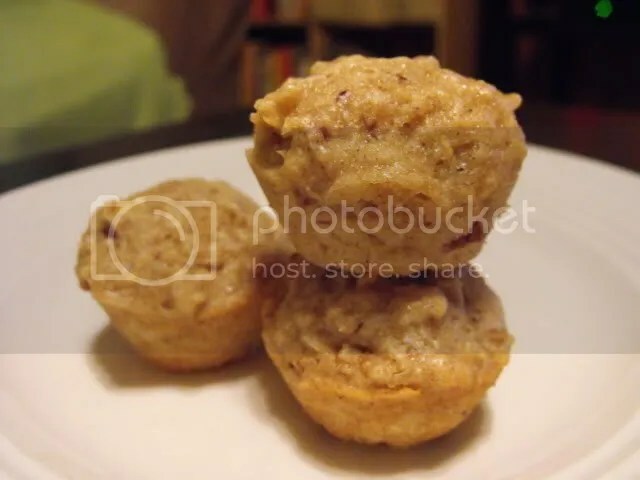 Lastly, and possibly most successfully, I adapted this recipe for Apple Lavender Muffins, making it vegan, whole grain and lower-fat. These muffins are moist with a large crumb, and lightly sweet and flavorful. The original recipe yielded 12 muffins, but somehow my batter was only enough for 9. 2. 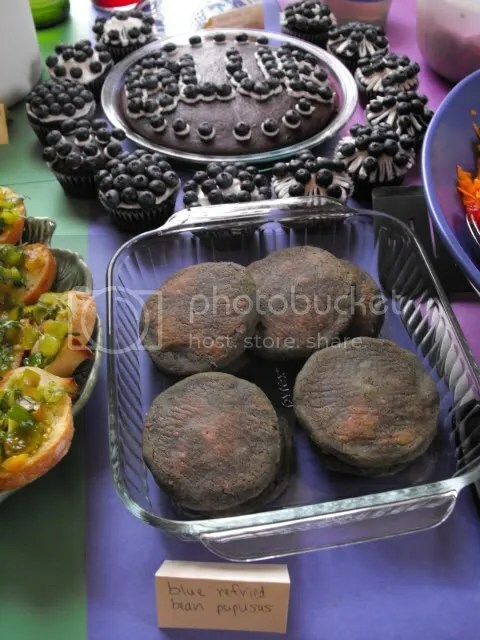 Spray nine muffin tins with oil or line with muffin cups. 3. In large bowl, sift together flours, sugar, baking powder and salt. Make a well in center. 4. In separate bowl, whisk together almond milk, lavender, applesauce and oil. Add milk mixture to flour mixture and stir gently just until batter is evenly moistened. Fold in 1/2 cup of the apples. 5. 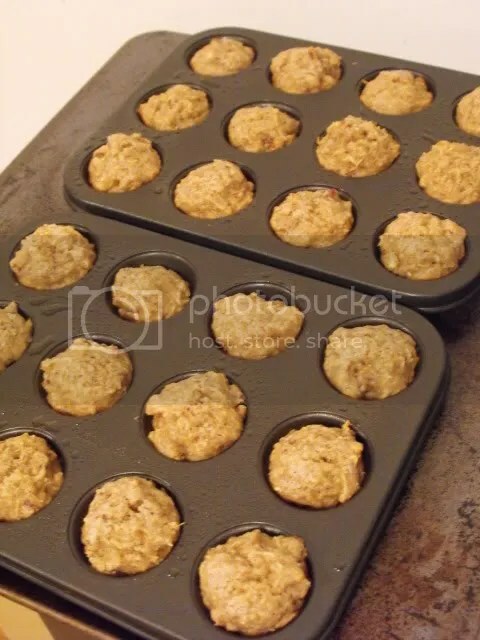 Fill prepared muffin tins about three-quarters full. Gently tap filled tins to release any air bubbles. 6. 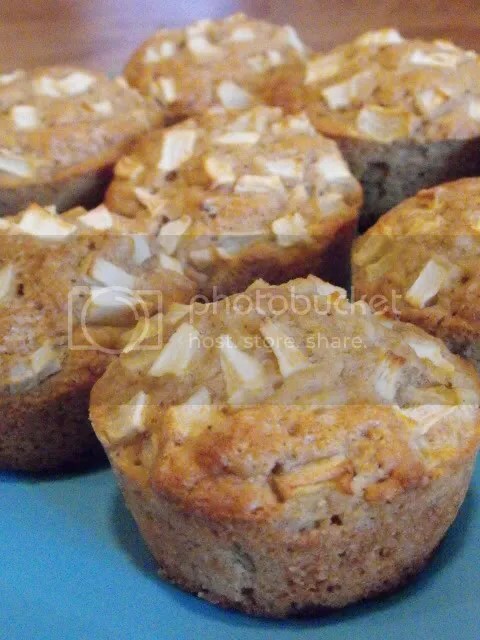 Sprinkle remaining diced apple over muffins. Bake until toothpick inserted into center of a muffin comes our clean, 25 to 30 minutes. Cool muffins in pan about 10 minutes, then transfer to cooling rack. Get thee some lavender and make these muffins! We successfully broke all the internets at our house (wireless AND non-), and with no solution in sight I am bringing you this post from my work computer. So, I’m gonna jam a bunch of stuff in and keep it brief. Firstly, I have been receiving a lot of love in food-related form lately, and I wanted to share the love with everyone! 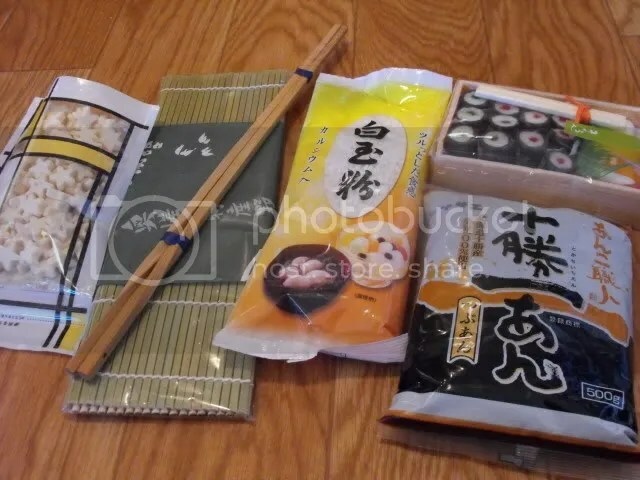 I participated in my third PPK care package swap, and this time my partner was from Japan and sent me all manner of awesome Japanese stuff. 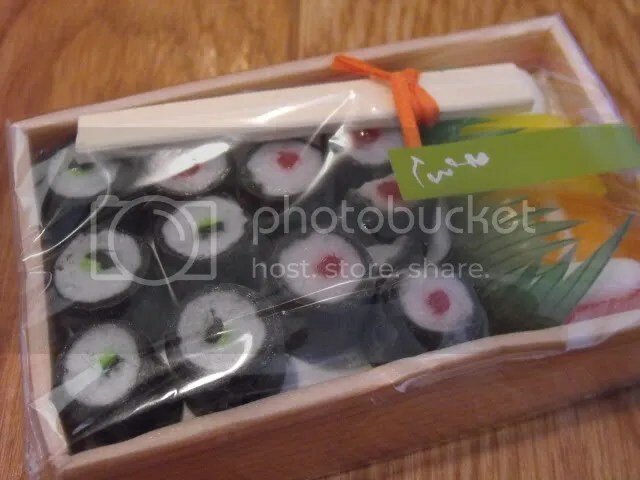 Bento toys! 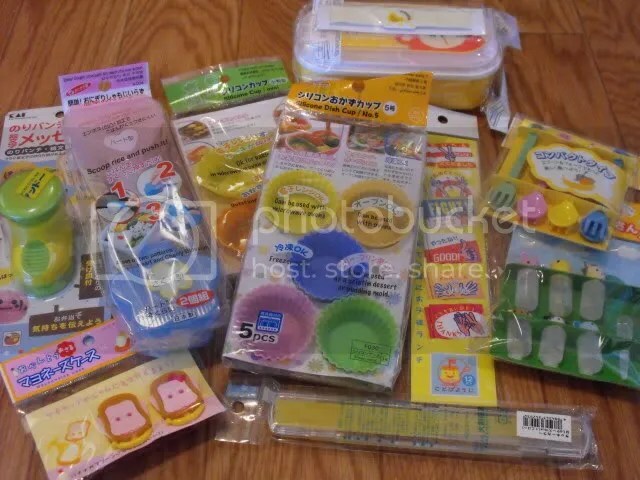 nori stamp machine that makes faces, onigiri molds, small containers, flag picks, a small monkey bento box int he back, little utensils, soy sauce bottles with animal heads, chopsticks in a case and monkey mayo holders. 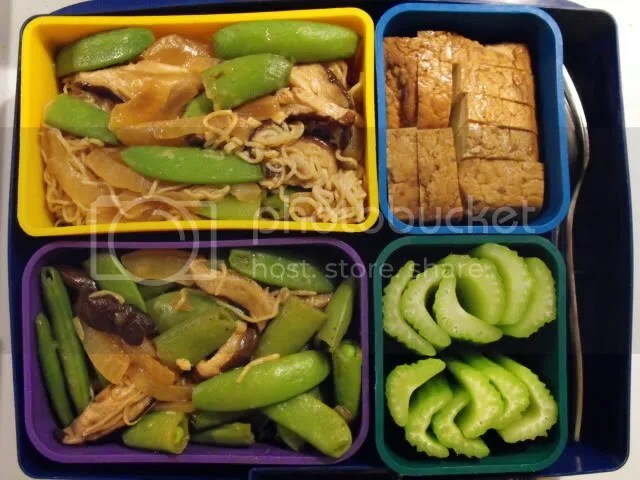 I’m definitely going to have to go Japanese in some upcoming lunches. I felt kinda bad when I got all this awesomeness because I mostly sent my partner Mexican food supplies and junk food. That’s what we do well here! Although he said he ate the Tings and Eco Planet Cheddar Crackers in one sitting each, so I think those went over well. A few weeks ago I got a completely unexpected box in the mail from my mom. She had read my blog post about having difficulty finding grits out here and sent me a “box of stuff Erin can’t find in CA”. 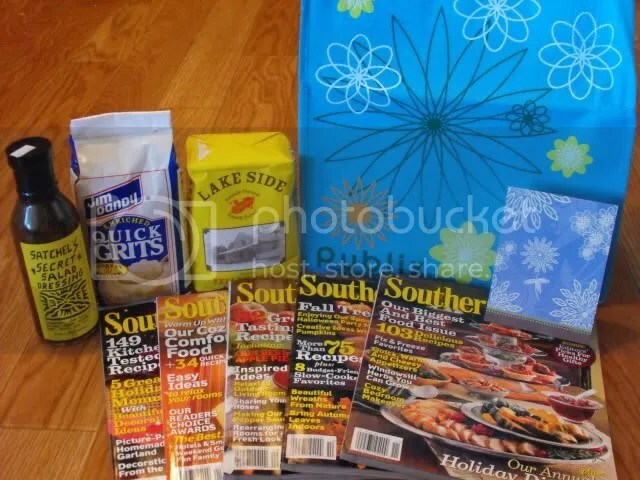 Satchel’s secret salad dressing, quick grits, yellow grits, a cute Publix tote bag, a cute notecard, and Southern Living. Yeehaw! Unfortunately, Satchel’s dressing is NOT vegan (which I only learned after eating it many times and falling in love…it has honey…sorry mom! ), but fortunately a friend of mine who also recently moved out here from Gainesville loves it, so I’m going to pay the dressing forward. This same friend gave me some love too! Although she sent this over the day after I mentioned the dressing…hmm…Anyway, she’s an amazing gardener and lives in a house that already had some goodness growing in the backyard. Thanks Hope! But I don’t just receive, I also give! Remember back in November when I celebrated my 1,000th comment by promising to send whomever posted it a package of sweets? Anybody? No? Well, Megan from The Sisters Vegan happened to win, and she happens to live in Berkeley, which is where I happen to work. So we agreed to meet up for dinner one night after work, at which time I could give her her goodies. She’s been testing for the upcoming cookie cookbook, so she was all cookied out and requested no cookies. And said that it would be nice to have something she could grab for breakfast on the way out the door to work. Enter muffins! 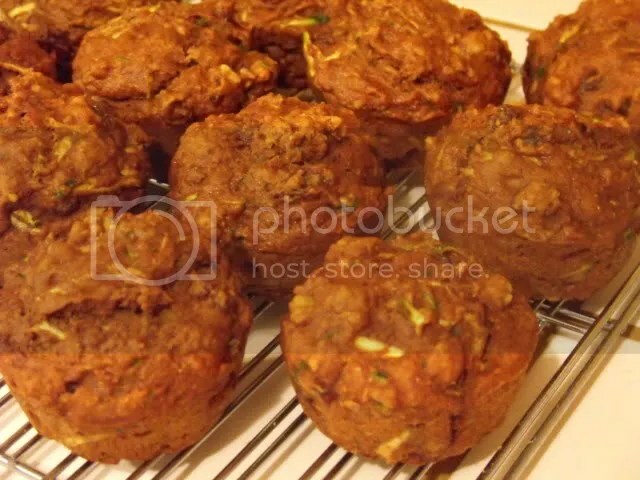 Full Meal Muffins from Vegan Lunchbox. These have zucchini, pomegranate juice (subbed for the apple juice called for), bananas, walnuts and raisins, and I subbed in some quinoa flour for a bit of extra protein. They’re completely sugar-free, sweetened by the bananas and juice and raisins. They turned out sweet enough, I suppose, but next time I make them I’ll probably add a bit of sugar or stevia. 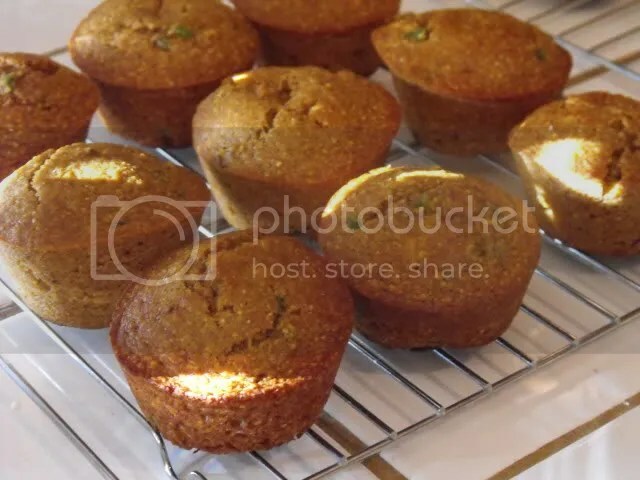 Smoky Jalapeno Corn Muffins. Made from my Buttermilk Cornbread recipe, with added jalapeno, roasted corn from TJ’s (freezer section), and liquid smoke. 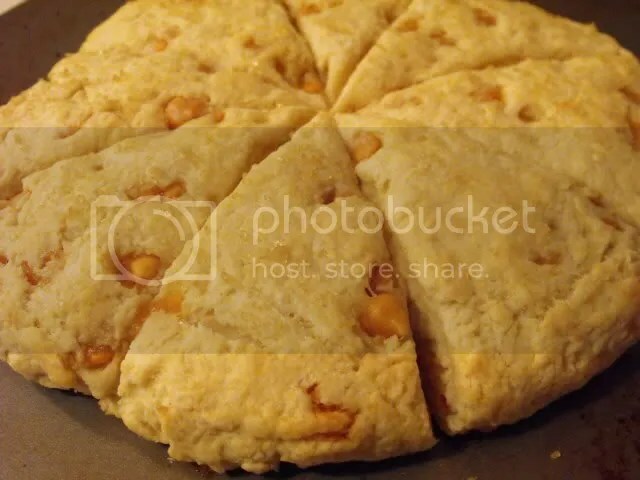 These were the real star, to me at least – Butterscotch Scones. I had a bag of butterscotch chips in the pantry screaming to be used, and I wasn’t too keen on the idea of butterscotch muffins, so I decided on scones. Even though I’ve only made scones once, and they turned out just okay. 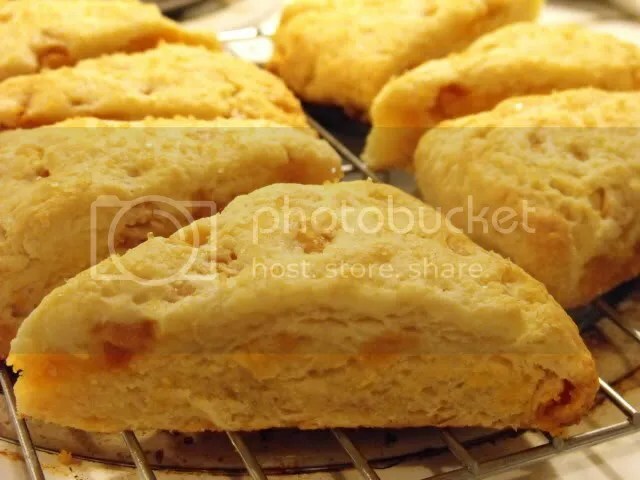 The first time I used the recipe from Vegan with a Vengeance, and while it’s entirely possible that I botched up the recipe, I wanted to make more “authentic” scones, using the pastry cutting method that most biscuits call for. So I looked in the good ol’ Betty Crocker Cookbook where I was sure I would find a scone recipe, and lo and behold, there it was. Veganized very easily, and these babies turned out beautiful. I typed out just the general recipe, so obviously you can add whatever extra ingredients you want, like nuts or fruit, but I would highly recommend the butterscotch chips if you have ’em. 2. Mix flour, sugar, baking powder and salt in a large mixing bowl. Cut in the Earth Balance using a pastry cutter until there are no large pieces of margarine and the mixture resembles fine crumbs. Stir in 6 Tbs creamer, just until the flour mixture is moistened. If there is still unincorporated flour, add creamer by the tablespoonful, just until mixture comes together. Gently fold in any additional ingredients. 3. Turn the dough out onto a lightly floured surface and roll in the flour to coat. Knead gently 10 times. Pat into an 8-inch circle on an ungreased baking sheet. 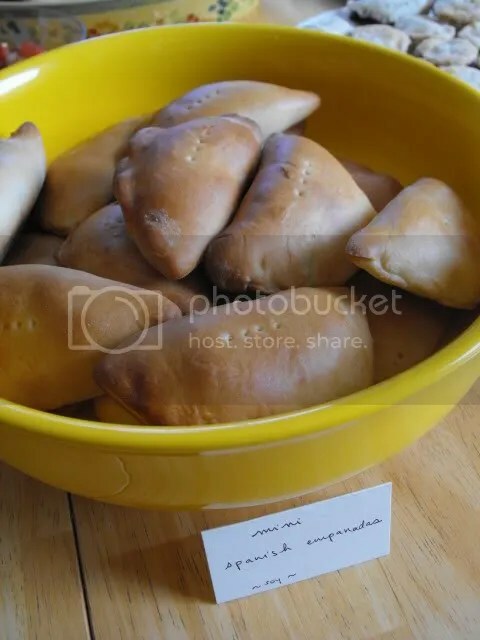 Cut into 8 wedges with a knife dipped in flour, and do not separate wedges. Brush the top with additional soy creamer, and sprinkle with coarse sugar. 4. Bake 15-18 minutes, until the scones are turning golden and the tops don’t give in to the touch. Immediately remove from the cookie sheet to a cooling rack, using a knife to separate the scones if needed. Serve warm. And finally, I’m very fond of the W.I.P posts on Musing From The Fishbowl. It stands for work in progress, and they’re crafty works which are posted on Wednesdays. 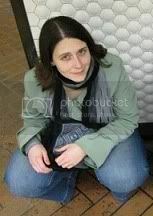 Other bloggers have joined in too – one who stands out for having super cute crafty posts is Amanda from Walking The Vegan Line. I wish I could join in on these posts, but the problem is I’m just not crafty. I’ll sew or make something every once in a while, but the craft is not in my blood. However, I have a few food projects that I’m working on, so I thought I’d share them as works in progress. 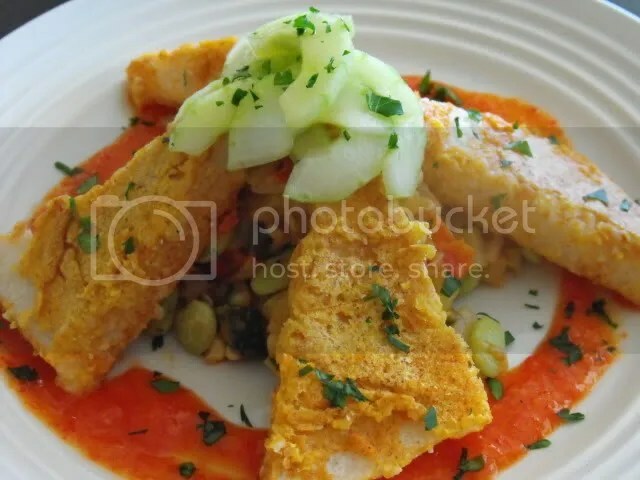 I first posted a picture of this dish that I’m working on for a cooking contest here, asking if anyone could identify the triangles, and giving the hint that they’re not tofu. The most popular guess was polenta, and that’s really SO close! They’re grit cakes. This is Garlic-Crusted Grit Cakes with Succotash Hash, Mango-Habanero Sauce and Quick Pickles. 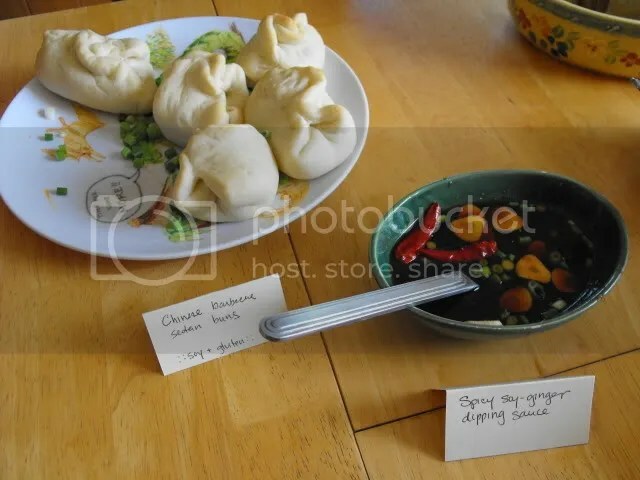 BF says it’s too complicated, but the contest rules say that you have to prepare it within two hours, and I can do that, and sometimes complicated is how I roll. I need at least one more run at this one and the contest deadline is the end of this month, so I need to get moving on it. 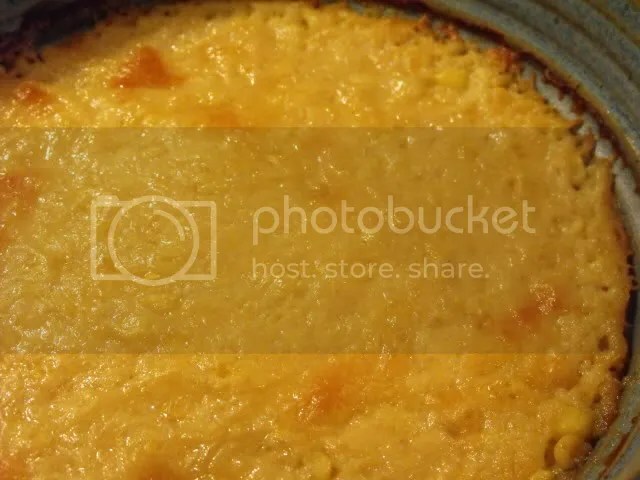 Another one I’m working on for a different contest is Creamy Corn Pudding. My mom makes this for almost every family holiday gathering and it’s so good, but it’s full of butter and milk and eggs, so no corn pudding for me. No more! It’s not perfect yet, but it’s darned close. I also need at least one more go at this one. 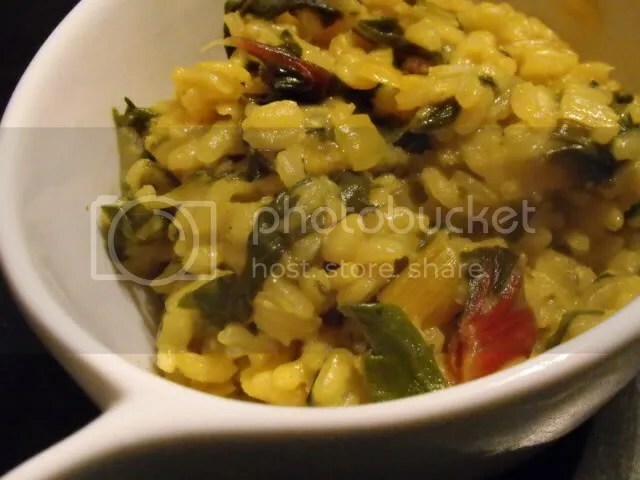 I posted a picture of this Swiss Chard Risotto two posts ago, and I thought I would have it perfect this time, but alas I didn’t have any white wine and subbed in with white wine vinegar and it was a little too much. Luckily, I’m getting chard again in my CSA tomorrow and I think with one more try it will be perfect. That’s it for now. I don’t know when I’ll be able to post again because we’re cheap and refuse to pay to fix our internets. Until then! update: BF fixed the internets, hooray! He is now a wireless router reconfiguration master.